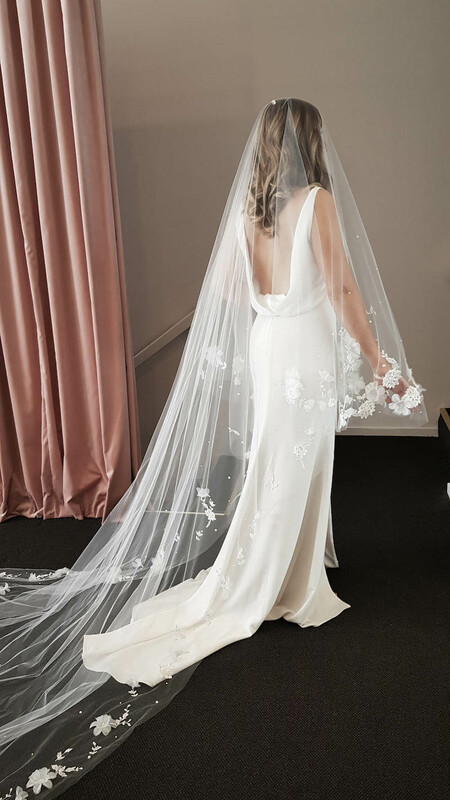 A showstopper veil for the maximalist bride, the Athena long wedding veil with flowers ticks all the right boxes for an ultra glamorous and luxurious wedding. 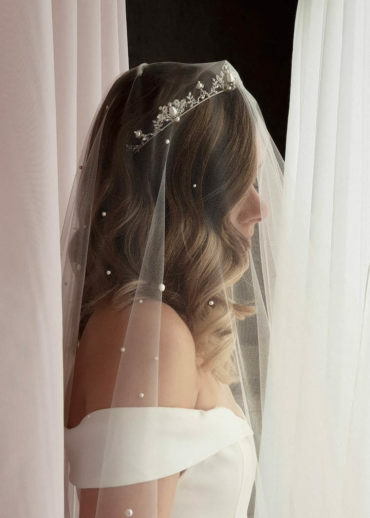 This wedding veil is not for the fainthearted – it was designed for bold and confident brides wearing modern wedding gowns, strong clean lines and structured silhouettes. This statement piece features delicate details and embellishments that will captivate and delight. 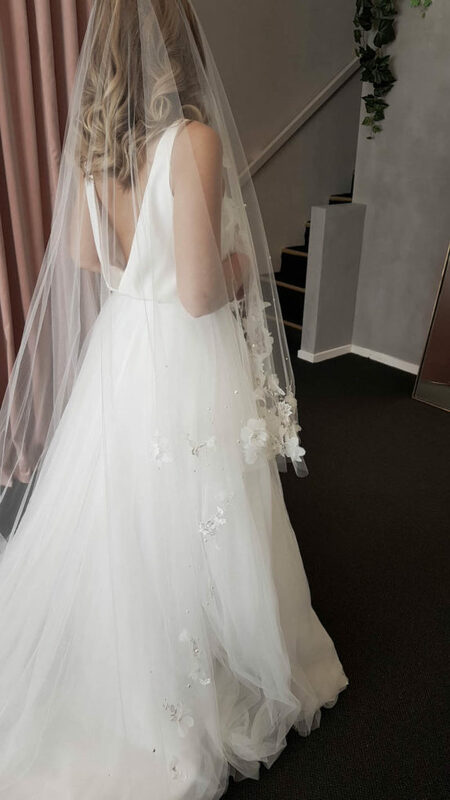 An eye catching accessory in a beautiful palette of soft ivory tones, it’s finished with handcrafted flowers, delicate hand-beading and hand embellished pearl accents along the full circumference of the veil. Customisable: Shorter or longer lengths available, including variations to the length of the blusher and placement of the embellishments. The Athena veil is made to order. Please allow 14-16 weeks for production plus delivery times. The Athena cathedral length veil is the ultimate in formality and suits wedding ceremonies in churches and large spacious venues. When combined with handcrafted couture details, the look is the ultimate in bridal styling. The Athena veil falls to 300cm from the comb to the end of the train. It features a long blusher layer which is designed to be pulled over your face for the ceremony or to capture beautiful photographs throughout the day. The blusher layer can be worn back, if you wish, and creates a beautiful cascade detail at the side. The lace details on this veil extend along the full circumference of the veil. This heavily embellished wedding veil is best suited for modern wedding dresses with minimal details and ultra clean silhouettes. Think strong lines, structured silhouettes with no lace or beaded elements. 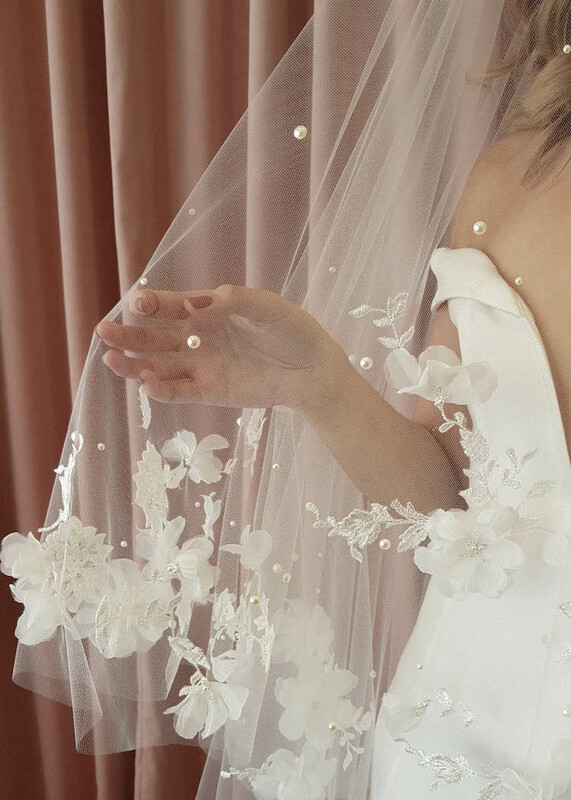 Let the details on this veil take centre stage. A blusher layer can be removed. This will require the lace placement to be reworked. Please contact us and we can chat about how to best customise this design to suit your wedding dress. The Athena veil is handcrafted from a lightweight bridal illusion tulle in soft ivory tones only. We like to aim for a colour match or a shade lighter than your wedding dress.